(PhysOrg.com) -- Is this one galaxy or two? Astronomer Art Hoag first asked this question when he chanced upon this unusual extragalactic object. On the outside is a ring dominated by bright blue stars, while near the center lies a ball of much redder stars that are likely much older. Between the two is a gap that appears almost completely dark. 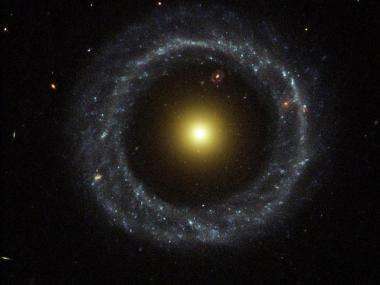 How Hoag's Object formed remains unknown, although similar objects have been identified and collectively labeled as a form of ring galaxy. Genesis hypotheses include a galaxy collision billions of years ago and the gravitational effect of a central bar that has since vanished. This image, taken by the Hubble Space Telescope in July 2001, reveals unprecedented details of Hoag's Object and may yield a better understanding. Hoag's Object spans about 100,000 light years and lies about 600 million light years away toward the constellation of the Snake (Serpens). Coincidentally, visible in the gap (at about one o'clock) is yet another ring galaxy that likely lies far in the distance. Maybe the central black hole was oriented such that it's jet,in earlier times- blasted the middle material towards the outer band- increasing the density of the interstellar medium and driving the formation of superdense, hot blue stars in the outer ring, and, at the same time, depriving itself of further matter to consume nearby? Caliban, AFAIK there is no evidence for a black hole at the center of this galaxy. The nucleus has a rather small mass to begin with(see paper), but I suppose a small SMBH or IMBH might exist. Its only going to get stranger and stranger. "Its only going to get stranger and stranger." I think your on to something. That ring galaxy in the background of Hoag's Object IS pretty strange, no? I have a lot of interest in Nassim Harameins research and theories concerning black holes at the center of galaxies goes. Yeah Frajo...Anyone who's calculations state that there must be a Black Hole in the center of galaxies must certainly be a charlatan right? Oh wait...those calculations are being found to be true! Imagine that! Take a close look at Saturn's North polar region as well. You will find that the "Strange Phenomena" there follows the dynamics set forth by his mathematics explaining why it should be there. Imagine that...it IS there! And then there's Jupiter, Neptune, and even the Sun exhibiting behavior explained by Haremein's model. Do some research. Personally I like the idea of having his findings not looked at more closely, but purely for reasons I would rather not say. Anyone who's calculations state that there must be a Black Hole in the center of galaxies must certainly be a charlatan right? No, but anyone who intentionally misrepresents peer review or subverts the peer review process IS a charlatan whether they're correct or not. As for the link you gave of Bobathon claiming that Haramein is a fraud, I will include the link with Mr. Haramein's reply. And you should also perhaps know that Bobathon wouldn't even give his real name. Know what "Bobathon" means? No? well check this out! HaHA! There was no misrepresentation what so ever Skeptic. Point it out. Point out what you're talking about with something tangible. And then tell me why some one so certain of this mans falsehood feels they shouldn't use their real name when it comes to making allegations of any kind. I find that rather as disturbing as their choice in Pseudonym. Why in the world would a scientist use wikipedia and arxiv to exemplify his points unless he was intentionally building a house on shaky ground? Einstein being the most famous example, as he published what were considered to be extremely controversial views at the time, while working as a third class clerk at the Burn patent office. Did he mean Bern patent office? It's funny how he states that ad hominem attacks are not the basis of science, and thdn goes on a multiparagraph ad hominem. Are you Haramein or in his employ? Ha, he's a 2012 doomsayer too. I don't mind at all what you adhere to frajo. As a matter of fact, I very much like the fact that you and others feel the way you do. I would rather not change the limping standard model of Physics we have today. Again, for reasons I would rather not talk about. I have no onus to convince anyone of anything. I will reiterate the link which I provided that addresses each one of those "Misrepresentations" and "Unscientific features" Bobathon (your link) went on about. Adhere to what you will, but don't attempt to use one anonymous persons prattle as actual fact. Even Bobathon had little actual information and yet mountains of supposition. Are you Haramein or in his employ? As for the Mayan calender ending in 2,012, about all that whole thing amounts to is simply buying a new calender! HaHA! That Haramein is caught up in the 2,012 hype does indeed raise my eyebrow to question, perhaps his rationality in that matter, but as far as where he has taken mainstream Astrophysics, or better said, where mainstream Astrophysics HAS validated some of his black hole theories, these are things that should not be overlooked. "Even Bobathon had little actual information and yet mountains of supposition." This is a longer, more detailed look at just a small fraction of the problems this theory (and it's originator) have. I took the time to read all the comments on both pages, as well as going to Haramein's site to read his response and extended comments. This man in not a scientist. The mathematical parts of his short published paper were written by another person(a student enlisted because of his lack of mathematical knowledge). So much for 'leading edge astrophysics' that he claims he's engaged in. AND the 2012 nonsense to boot. Have you read his 'paper'? Where you simply just click on my screen name to go to my profile, I do have my real name there. As for my private motivation NOT to interfere with Science remaining undisclosed, I definitely have a very good reason. Concerning any further dialog about this matter would undermined that. As I again reiterate, feel free to adhere to that which you feel is right. The Ring galaxy looks like a blueberry fruit loop! HaHA!